"Postcard - Ft. Hancock, NJ - Circa 1910. " (1840) Postcard - Ft. Hancock, NJ - Circa 1910. -Condition: Good + Photo of Parade and Review. 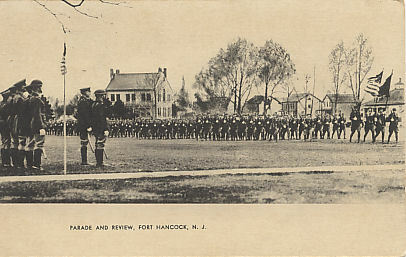 Sandy Hook became the home of Fort Hancock in 1899, with the completion of the first thirty-four buildings, including eighteen Georgian Revival style homes for officers and their families. It was used as a coastal defense until 1974. Fort Hancock was armed with the most sophisticated weaponry of the day. In 1893 Battery Potter was completed, featuring the nation's first and only steam-lift gun battery. Card measures 5 1/2" by 3 1/2". Price: $7.00 +shipping.